I love browsing the Wool and the Gang website. Have you ever been to it? They make knitting look so cool. Anyway, they sell a jersey yarn that's made out of fabric roll cut-offs from fashion factories in Turkey. It's a great concept because those cut-offs normally end up in the trash, so this yarn that they're selling is helping to reduce waste. If you're in the market to purchase some yarn for a summer knitting project, I really think this is the way to go. Last week, I stumbled across a big square of pink(ish) jersey fabric in the sale area at Colorado Fabrics that I just knew would make an awesome ball of yarn and hopefully end up as a knitted tank top. It was roughly 1.5 x 1.5 yards and it cost me less than $2, which is a total steal for yarn. 1. Lay it out flat on the floor. 2. Cut the corners off so it's shaped like a rounded rectangle. 3. Cut off a 1-inch strip around the outside of the rounded rectangle that slowly spirals into the middle of the fabric until the whole sheet of fabric has turned into a long snake of 1-inch fabric. Don't worry too much about making the width of the strip perfect. 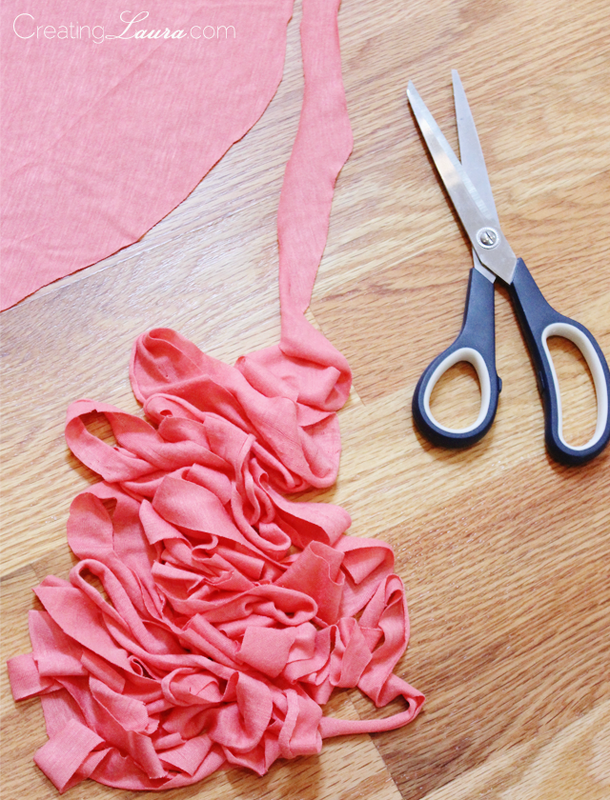 Once the long fabric strip is formed, its edges will curl and hide all the imperfections. 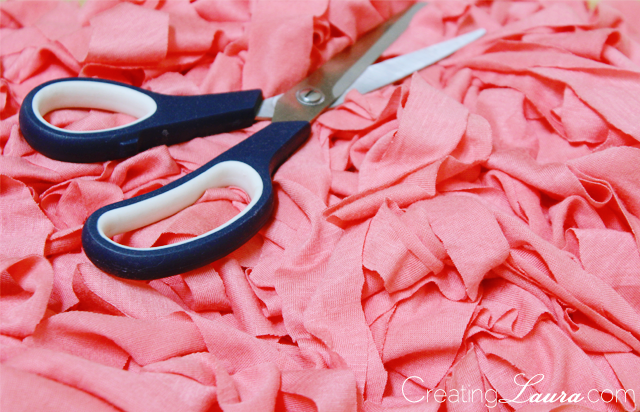 I also recommend using good quality fabric scissors for this whole process because of the huge amount of cutting involved. 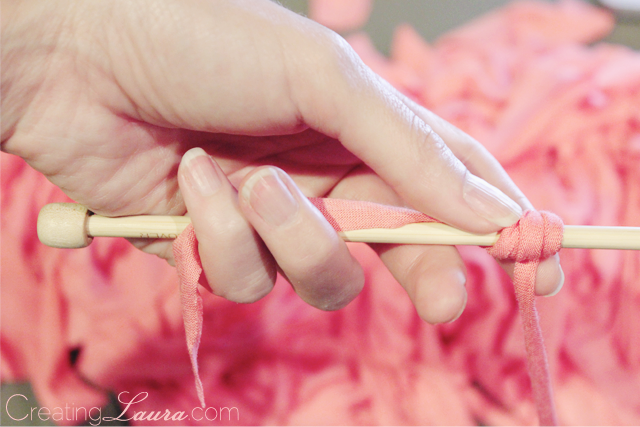 Once you've cut the entire piece of fabric into a long 1-inch wide strip, it's time to roll it into a ball. Let's start calling that long jersey strip "jersey yarn" because that's what it is now! 1. Find one end of the jersey yarn, and hold it in your left hand against a knitting needle, as pictured below. Any old knitting needle will do. I used a size 9 for this project, but it really doesn't matter. 2. 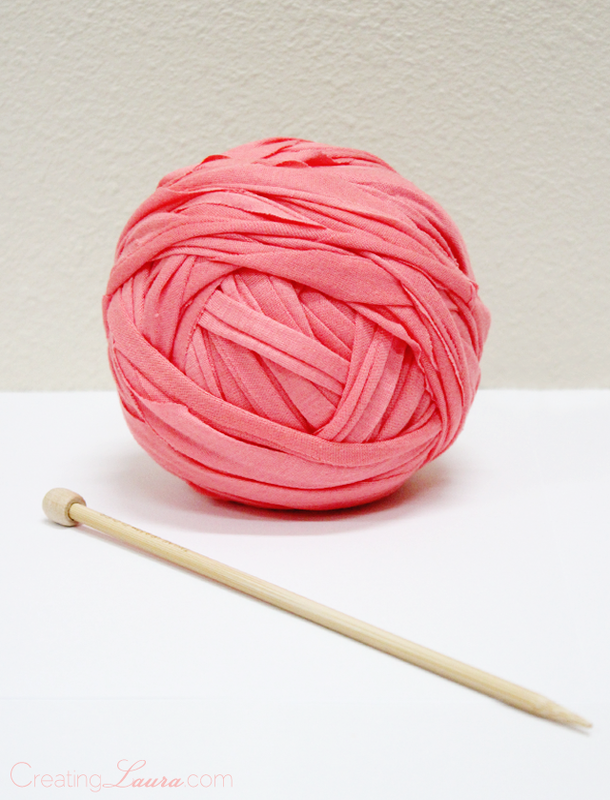 Keeping the end of the yarn and the knitting needle in your left hand, use your right hand to wind the yarn into a ball around the needle. 3. Keep winding until you've made a big ball out of all the yarn. 4. Pull the knitting needle out of the center of the ball, and you're all finished. 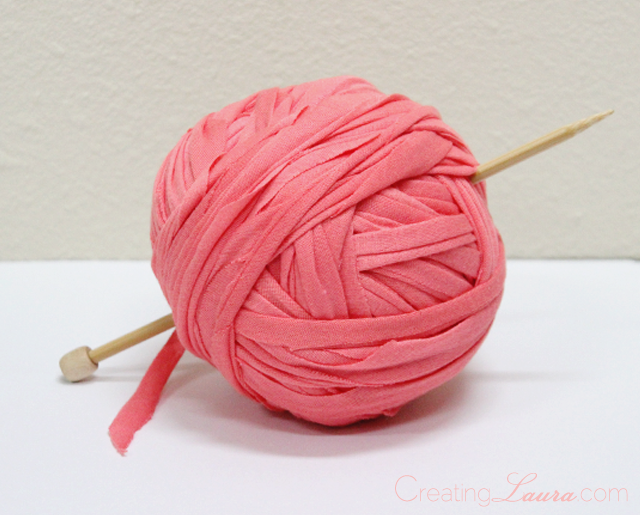 The end of the yarn that you were holding in your left hand should still be sticking out of the center of the ball. This is the end that you'll pull out and knit with. I know you can also make your own jersey yarn out of old t-shirts, but I wanted a really big ball of jersey yarn, so I figured this would be the best option. You could also make this yarn out of a big bed sheet if you wanted to. I love my jersey sheets, though, so you won't see me cutting those up any time soon. Oh, you clever lady, you! This is such a great idea. I'm sure I've got some old jersey lying around somewhere, so I'll have to try it out.